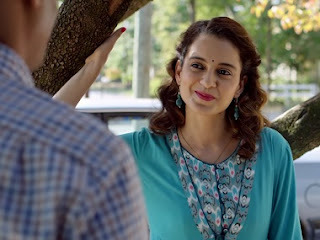 For a young woman who thinks she is very smart, Praful Patel (Kangana Ranaut) is rather dumb, and that is a fatal flaw in Hansal Mehta’s Simran, a film about an Indian woman in the US, who is forced to take to life of petty crime. Praful is a divorcee, who works as a chambermaid in a hotel, a dead end job if ever there was one. Her constantly nagging father (Hiten Kumar) runs a small business in snacks; her mother (Kishori Shahane), looks beaten by fate. This is the dark side of the American dream—not the ‘Potel’ kind of Gujarati success story. At the most Praful can dream of a ‘Minority Housing’ flat to escape the stifling atmosphere at home, but her father knows she is hopeless with money. A chance visit to Las Vegas with her cousin, gets Praful into gambling, and suddenly, as she gets off the high, she has run up huge gambling debts, and has a couple of loan sharks after her. In desperation, she takes to robbing banks, and at least some of the humour comes out of the hysteria of the media, and the exaggeration of the people robbed, as they spin a legend around what looks like a teenage prank. It seems strange than in this age of CCTV cameras, she gets away using minimal disguise and her own car. The cops in Atlanta are incapable of even lifting prints from her glove-less hands? Praful knows that she cannot get away without paying the sharks, but there does not seem to be much of urgency or despair in her manner; when she should be scared and jittery, she has a flirtation going with sweet-natured Indian suitor, Sameer (Soham Shah). This is by no means a ‘feminist’ tale; it does not evoke much sympathy for the leading lady, and not a shred of admiration. In spite of some stabs at humour, the film never reaches the level of screwball comedy it could have, with a protagonist as ditzy as Praful. Mostly without make-up, Kangana Ranaut acts the hell out of every frame she is in—too bad she is saddled with a damp squib part.